I was born in Guernsey in 1987 and have lived in the island all my life till heading off to University to study BA (Hons) Photography in 2005. Now currently in my second year of the degree my style and techniques have become more refined and I often find myself producing images which fall into a documentary genre. 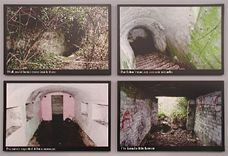 The piece shown came about after reading the article "Bunker Dweller Part of Local Lore", by Nigel Baudins in the Guernsey Press on 18th March 2006, I decided to further research the life of the hermit mentioned, Steve Picquet. From earlier articles I found I was able to piece together a brief outline of his life. Steve became well known in Guernsey in the sport of boxing, later setting up his own club. When Guernsey became occupied in WWII, Steve and members from the boxing club stole from the Germans, the likes of meat and of course cigarettes. Eventually Steve was caught and sent off island to prison. Returning after the war he had no where to live and suffered with a back injury, which made it hard to get work. Former members of his club helped him transform the bunker at Pleinmont into a home. This he named "Onmeown" here he lived for over a decade till his death in 1963. When I went to shoot numerous times at the now deserted bunker, I couldn't understand how anyone lived there for so long. The damp stuck to the walls and it always seemed to be flooded somewhat. The photographs I selected for the series depict his home as he walked his friend Kay Bragg through it. They show my walk through his home also, although I was unaccompanied. The text which accompanies the photographs is his words to Kay Bragg and shows how he was proud of this bunker he had made a home.